We roll onto Day 3 of Royal Ascot and the feature race, the Gold Cup xsxuddqwyyuxyxbfvzsfuddvt(4.20), really does look a renewal to savour. I personally was really impressed with Stradivarius at York when he won the Yorkshire Cup and I think he’ll come on for that first run, as Mr Gosden’s horses all tend to. Order of St George definitely deserves to be the market leader. He’s an unbelievable horse that should just be admired for all he’s managed to achieve in his career to date. But he’s getting vulnerable as he gets older and it wouldn’t surprise me if Stradivarius were to beat him. With the ground set to be Good to Firm again, I think he shouldn’t have any issues seeing out the trip either; he won a Goodwood Cup last year over two miles in good style beating older horses, after all. The other principals in Torcedor and Vazirabad will need to find something extra to get on terms and will be scrapping it out for third, in my opinion. While I sadly don’t have a ride in the Gold Cup; I do have two interesting mounts to look forward to. First up I ride Mini P for Brian Meehan in the Hampton Court Stakes (3.05). The race holds cherished memories for me as I claimed my maiden Royal Ascot win it last year on Benbatl; so I’ll be praying that the magic can be repeated. Mini P has had only the one career start when he outran his 50/1 price tag to finish second in a Newbury maiden, so we’re still on something of a factfinding mission with him. I’ve ridden him out a few times at Manton; he gives me the feel of a nice horse and he’s been working well with the likes of Spark Plug (rated 107), but this is undoubtedly a huge step up and we’ve not got the easiest of draws out in stall 14. He’s a horse that we hope will have a big future, tomorrow’s race will allow us to know how lofty our ambitions should be. My only other ride at Ascot tomorrow is aboard Lethal Steps in the Brittania Stakes (5.20). He’s an interesting new recruit to Andrew Balding’s yard having been previously trained in Ireland by Ger Lyons. We like the look of him, but to be honest he hasn’t done loads of work at home as he’s already had a few runs this season before he came to us. The stiff mile at Ascot will likely test the limits of his stamina, so I’m inclined to think that we won’t look to race him too close to the pace. The Brittania is always an extremely competitive race and he might just be off a mark that he finds a bit tough. We like him a lot at home but have had to wait a while to run him as he wants soft conditions. I think he’ll run really well. 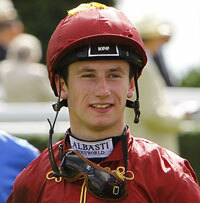 The number one retained rider for Qatar Racing, Oisin Murphy, will be regularly giving his thoughts and insight into the Series throughout the year.